Brittney has a wealth of early childhood education experience, including navigating the NAEYC accreditation process and working in an Early Achievers center. Brittney is currently working on a Master’s in Early Childhood Education from Walden University. She also holds a Bachelors in ECE from Rasmussen College and a Bachelors in Creative Writing from ​Eastern Washington University. As an e-Learning Instructor, Brittney is responsible for supporting the ECE and CDA Virtual Classroom students through the training process. Brittney works closely with the Academic Coach to review assignments, monitors discussion threads, answers inquiries/emails, monitors student engagement, and provide online student support. 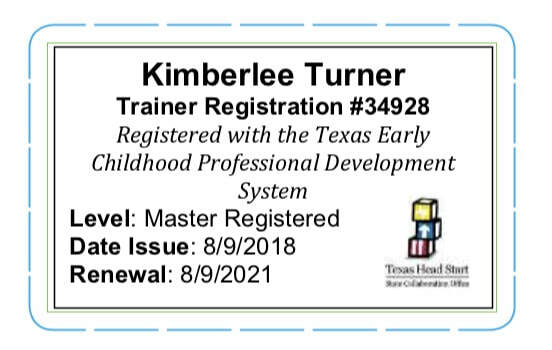 Kimberlee is a STARS trainer through Washington DCYF MERIT. Corinne provides support to the CDA Virtual Classroom students through the training process. She works closely with our team of online educators to review assignments and monitors discussion threads. Corinne serves as the facilitator and grader, while the online educators are the official state approved trainers. As part of our student support team, Corinne​ answers inquiries/emails, monitors student engagement, provides online student support, and regularly collaborates with team members on development. You may also find Corinne at a local early childhood conference, where she ambitiously manages our vendor booth. ​Claudette is a full-time faculty member at Heritage University and also an adjunct staff STARS Trainer with Successful Solutions Training in Child Development. She has over 25 year’s experience in early childhood education both as a teacher and as an administrator. Claudette’s extensive early childhood career, which has included previously being a director, center licensor, a college ECE professor, and a grant coordinator brings a wealth of resources to our planning and development team. Alisha has been a dedicated student support team member at Successful Solutions for over 5 years. As a Student Support Specialist, Alisha has the patience to help students who are new to Web-based learning. Alisha is eager to provide students with support throughout their eLearning enrollment, and gladly help you find your way. If you are a Washington State student, Alisha will record your completed training with MERIT. Anneliese is our go-to person for setting up enrollments for large accounts. She works hand-in-hand with Head Start, YMCA, and other large programs to facilitate the enrollment process, track staff progress, and manage their account status. Anneliese has a comprehensive knowledge of current guidelines, policies, and regulations as they pertain to child care licensing, and state mandated training. Anneliese assists in supervising our support staff team, working closely with our online educators to assure that program goals are adhered to. ​As a dedicated early childhood professional, it is Genie’s mission to provide quality training to every extent possible; to meet all state and National standards for online training, to continuously work toward improving the methods that are used to present eLearning courses and further challenge those working with children to achieve greater accountability. We are committed to providing early childhood educators with the highest quality of online training in an easy to use format. Genie directs a team of trainers and student support staff to ensure that early childhood professionals are supported in their efforts to pursue professional development and further their careers in early childhood education.